Are you looking for a study guide on Pediatric Infectious Airway Diseases? If so then you are definitely in the right place! 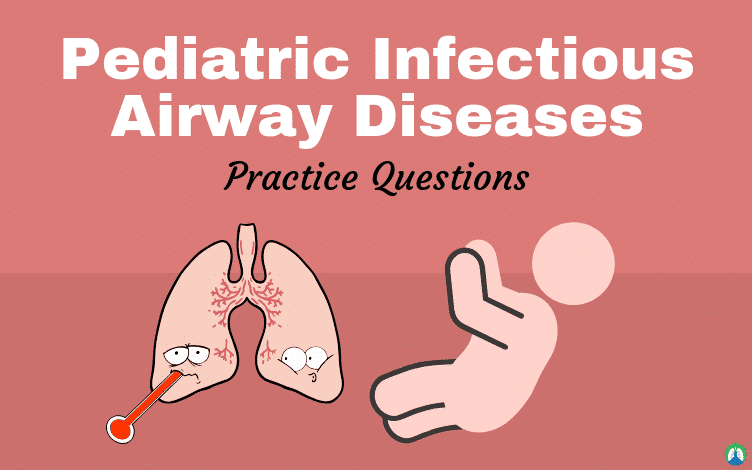 As you will see below, we have compiled a ton of practice questions about all the different pediatric airway diseases that you need to know about in Respiratory Therapy school. This information is important to know, especially if you are interested in working with neonates or pediatrics some day. So if you’re ready, let’s go ahead and dive right in! It is a bacterial infection that causes swelling which blocks air to the lungs. A key to remember is that this occurs ABOVE the vocal cords. 2. What is the cause of Epiglottitis? HiB (Hemophilus influenzas type B). 3. What kind of patients does Epiglottitis affect? Allergic reaction, swelling of lips and eyes. 5. What are 4 symptoms of Epiglottitis? Drooling, dysphagia, dyspnea, and dysphonia. 6. What are the signs of Epiglottitis? Increase work of breathing, fever, and stridor. 7. What is the classified chest x-ray of Epiglottitis? 8. Is Epiglottitis sub or supraglottic? It is supraglottic, which is above glottis. 9. What is the management and treatment for Epiglottitis? Intubate, antibiotics, and steroids for inflammation. 12. What ages does croup affect? 13. What are some symptoms of croup? Hoarse voice, barking cough, cough, and low-grade fever. 14. What is the diagnosis of croup? When the chest X-ray has a ‘steeple’ sign. 15. Is croup sub or supraglottic? 16. What is the management and treatment of croup? Racemic epi, steroids-dexamethasone, and heliox therapy. 17. What is Bacterial Tracheitis? It is a combo of both croup and epiglottitis. 18. What kind of airway obstruction can epiglottitis be? 19. What does epiglottitis affect? The supraglottic structures in the airway. 20. Who does epiglottitis commonly affect? Children between the ages of 2 and 7 and immunocompromised patients are affected. 21. What is the most common cause of Croup? It is most commonly caused by the parainfluenza virus. 22. What are the noninfectious causes of epiglottitis that are due to trauma or thermal injury? Chemical sulfuric acid, foreign bodies, smoke inhalation, and angioedema. 23. What are the clinical symptoms of epiglottitis? Dysphagia, drooling, dyspnea, dysphonia, and stridor. Disorder of the voice; voice sounds are muffled. 27. How do you diagnose epiglottitis? Laboratory results showing elevated WBCs and positive blood cultures. By looking in the mouth, by using a tongue depressor and seeing a cherry red epiglottis. An x-ray that shows a hyperextended neck and thumb sign which is indicative of thickening and rounding of the epiglottis. 28. Do you want to take an oral temperature of an epiglottitis patient? No, do not put anything in their mouth you just intubate. 29. What should you do if a patient is drooling with epiglottitis? 30. What is the treatment of epiglottitis? Oxygen therapy, recognition of early warning signs of respiratory distress, possible intubation/tracheotomy, antimicrobial therapy, corticosteroids, and ICU. 31. Where is airway stabilization typically done? In the operating room, where an artificial airway can be placed in a controlled environment. 32. How should you treat mild epiglottitis? With racemic epi and cool mist therapy. 33. What kind of person should do the intubating with epiglottitis? Preferably, a physician or someone with experience. 34. What is the medical name for croup? A viral-mediated inflammatory condition of the subglottic airway which affects the area between the true vocal cords and the trachea. 36. What is the narrowest point of the pediatric airway? 37. What can croup cause? Significant airway in children between the ages of 6 months to 3 years. 38. When is the peak incidence of croup? 39. What are the characteristics of croup? Barking cough, stridor, hoarse voice (seal-like), and respiratory distress. 40. What are the most common infectious agents in croup? Parainfluenza viruses (types I, II, III), respiratory syncytial virus (RSV), influenza viruses A and B, adenovirus, measles, and varicella. 41. How is croup classified? Mild, moderate or severe with the Westley croup score. 42. What does a higher Westley croup score indicate? The higher the score the sicker they are. 43. What things are used to get a Westley croup score? Stridor, chest retractions, air entry, cyanosis, and level of consciousness. 44. 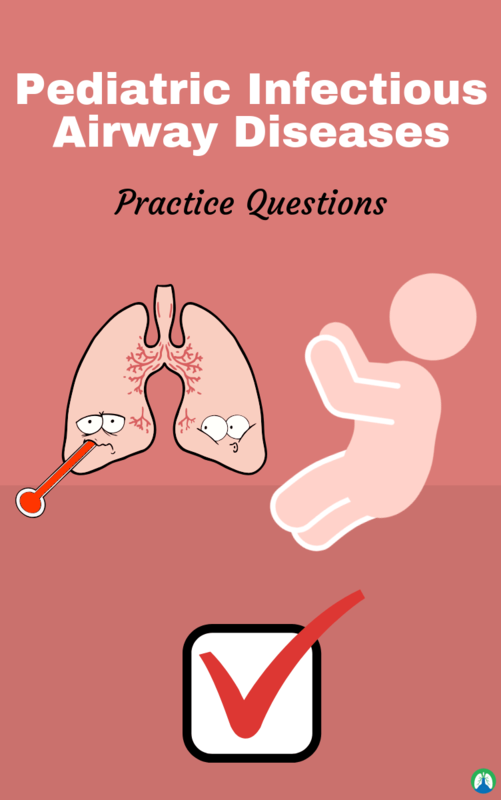 How do you diagnose croup? Ap x-ray showing narrowing of the subglottic area or a steeple sign. If x-ray findings are absent they diagnose off patient history and physical examination. 45. How is croup treated? 46. What is bacterial tracheitis? 47. What is bacterial tracheitis also know as? Laryngotracheobronchitis, pseudomembranous croup, and bacterial croup. 48. What is bacterial tracheitis characterized by? Marked subglottic edema and thick mucus or pus containing secretions. 49. When is peak incidence with bacterial tracheitis? 50. Who does bacterial tracheitis affect? Children from ages 6 months to 8 years. 51. What is the pathophysiology of bacterial tracheitis? thick mucopurulent exudates (secretions w a high concentration of mucus and pus). 52. What is the most common pathogen of bacterial tracheitis associated with? 53. What are clinical tracheitis clinical manifestations? Several days history of upper respiratory symptoms, low-grade fever, cough, stridor, hoarseness, tachypnea, uncomfortable when lying flat, and poor response to conventional medical therapy for croup. 53. What is the treatment of bacterial tracheitis? 54. What kind of element is helium? One of the lightest elements due to its low density. 55. What color are heliox tanks? Brown (helium), green tops (O2). 56. What is the sole purpose of heliox? To lower the total density of the gas mixture, nitrogen is replaced with helium as carrier gas. 57. What is heliox not used to treat? The underlying cause of increased airway resistance. 58. What is heliox used to treat? To decrease WOB until the cause can be resolved and treated. 59. What kind of interface in heliox given thru? A nonrebreather or heliox mask cannot be given thru a cannula and must make sure the bag stays inflated. 60. What are the 3 heliox mixtures? 80% helium 20% O2, 70% helium 30% O2, and 60% helium 40% O2. 61. How do you calculate the actual flow to the patient from an oxygen flow meter? 80:20 mixture: the observed flow rate multiplied by 1.8. For the 70:30 mixture: the observed flow rate multiplied by 1.6. And for the 60:40 mixture: the observed flow rate multiplied by 1.4. 62. How do you calculate what flow should be set on O2 flowmeter? 80:20 desired total flow divided by 1.8. For 70:30 desired total flow divided by 1.6. And 60:40 desired total flow divided by 1.4. 63. What are the heliox spontaneous limitations? Young children who may not tolerate a tightly fitting mask that is required to minimize air entrainment. Oxyhood because the heliox ends up at the top of the hood (helium is lighter than O2, so helium goes to the top and O2 to the bottom). 64. What is the major cause of arrests in children? 66. What is the difference between the pediatric and adult airway anatomy? The larynx is more anterior in a child; also, they have a larger tongue and a larger epiglottis with less cartilage, and the narrowest part is the cricoid cartilage vs. the vocal cords in adults. 67. What is the shape of the pediatric airway? A funnel down to the cricoid cartilage. 68. What is the difference between the pediatric and adult airway? Pediatric airways are more prone to airway obstruction, nasal breathers so snotty nose affects breathing, smaller larynx so less space. 69. Do children have more airway resistance than adults? Yes, because of the smaller radius. 70. When would you act immediately on a child in respiratory distress? 71. What is stridor evidence of? It is evidence of an airway obstruction. 72. Inspiratory adventitious noises such as stridor would indicate what? Obstruction above the vocal cord. Some examples of this are croup, epiglottitis, and foreign bodies. 73. Expiratory adventitious noises such as wheezing would indicate what? Obstruction below vocal cords; Asthma, bronchiolitis, and lower obstruction. 74. Biphasic stridor would indicate what? Obstruction at the vocal cord or a vocal cord problem itself. 75. What are some airway treatment modalities? Corticosteroids, Vasoconstrictive agents (racemic epinephrine), Heliox, and airway adjuncts. 76. When would you NOT use corticosteroids for airway treatments and why? For emergent situations because it has a delayed effect. 77. What is the benefit of heliox? Less dense (and thus less viscous) than nitrogen so reduced turbulent flow. 78. What is the cause of acute laryngotracheobronchitis (croup)? 79. What is the pathophysiology of croup? Viral inflammation leads to swelling of the supraglottic and laryngotracheal area, increasing mucous production and causing turbulent airflow across narrow airway. 80. What is the difference between bacterial tracheitis and croup? Bacterial tracheitis is toxic appearing, high fever, and much sicker. 81. What is the differentiating factor for epiglottitis? Must maintain a certain position in epiglottitis to breathe better. 82. What is the treatment of croup? Supportive care: hydration, supplemental oxygen, and support work of breathing; and steroids and ENT eval if symptoms persist for more than 3 days. 83. What is the traditional cause of epiglottitis? 84. What is the treatment for acute bacterial epiglottitis? Steroids and antibiotics unless the kid isn’t breathing then do immediate airway management. 85. What is the most important cause of hypoxia? 86. What kind of disease is bronchiolitis? 87. Who is mostly affected by bronchiolitis? Children less than 2 years old. 88. What would bronchiolitis look like in an older child? A nasty cold or URI. 89. What are the risk factors for serious bronchiolitis? History of prematurity, congenital heart disease, neuromuscular disease, known airway anomalies, immunodeficiency, and infants less than 2 months old. 90. What are the distinguishing symptoms of bronchiolitis? A lot of nasal congestion. If it gets better with nasal wash out, think bronchiolitis. 91. When is bronchiolitis at its peak course? 92. What is the pathogenesis of bronchiolitis? Viruses damage bronchioles which leads to edema, excessive mucus, leading to airway obstruction and atelectasis. 93. What should you worry about if a bronchiolitis patient isn’t getting better? 94. What disease is commonly missed in children? Myocarditis and congestive heart failure (CHF). Thank you so much for reading all the way to the end of our study guide on Pediatric Infectious Airway Diseases. I hope that the practice questions were helpful for you. If you truly learn this information, I have no doubt that you will increase your chances of earning a higher score on your exams in Respiratory Therapy school. I wish you the best of luck and as always, breathe easy my friend.